Revolutionary when built in 1881, Bruichladdich Distillery remains at the forefront of modern whisky distilling. Today, under the ownership of Rémy Cointreau, Bruichladdich retains its heritage by using 100% Scottish-grown barley, trickle distilled through tall stills before being matured for all its life in warehouses on the shores of the Isle of Islay. Many of the processes require product to be transported between locations throughout the site – a requirement that places tough demands on its material handling equipment. In order to service the rapid growth of its business, Bruichladdich Distillery upgraded and expanded its operation with the addition of a new, high-density Very Narrow Aisle (VNA) warehouse, and at the same time introduced improvements in production routines. A variety of handling tasks called for a wide range of handling equipment to ensure optimum productivity while keeping costs under control. The material handling fleet is pivotal at Bruichladdich and Crown rose to the occasion. The Crown FC Series 4-wheel electric forklift truck took centre stage. Its spacesaving design, dual drive motors and excellent visibility provide manoeuvrability in tight spaces, while the hydraulic system has been optimised to give greater lift, tilt and lower speeds, resulting in increased productivity and longer battery life. 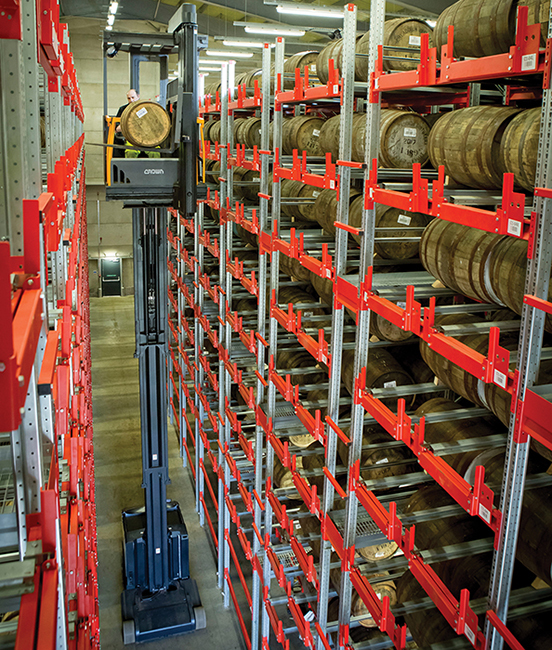 In the dry goods warehouse, Crown’s ESR Series reach truck ensures incoming pallets are moved quickly and efficiently into storage until needed to feed the bottling hall and production lines while for single-bottle picking the WAVE® Work Assist Vehicle® is the versatile and safer alternative to traditional rolling ladders. In the bottling hall, Crown’s WP Series pallet truck moves pallets from the bottling line ready for the case goods warehouse, giving increased productivity over stacking cases by hand. > Operators of the ESR Series reach truck have gained confidence and performance from Crown’s intelligent Optimised Cornering Speed (OCS) system that automatically adjusts cornering speeds for maximum safety and performance. > The Crown WAVE Work Assist Vehicle is a safe alternative to traditional rolling ladders, reducing the risk of products falling from a ladder during single-bottle picking. > Crown’s MonoLift™ mast on its TSP Series VNA truck enjoys unrivalled stability at height which, along with the comfort and precision built in to the MoveControl™ seat, makes for high levels of operator satisfaction and performance. > Close collaboration between Bruichladdich Distillery and Crown produced a solution tailored to the needs of the new VNA facility and optimised for safety and productivity.